NEW YORK, NY and OSLO, NORWAY--(Marketwire - January 22, 2008) - TANDBERG® (OSLO: TAA), a leading global provider of telepresence, high-definition videoconferencing and mobile video solutions, today launched the TANDBERG Codian MSE 8321 gateway, enabling organizations to hold up to 1,000 concurrent videoconferencing calls between IP (Internet Protocol) and ISDN. Both service providers and large enterprises will now have the flexibility to deliver a variety of services at an unprecedented level, worldwide. 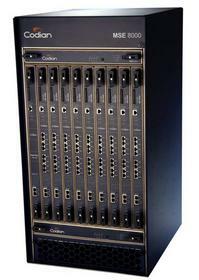 The TANDBERG Codian MSE 8000 Series is a single-chassis solution that provides multiple and interchangeable functions, including gateway, multipoint conferencing, recording and supervisor blades. Future plans include upgrading multipoint to support HD. This all-in-one solution will have the ability to connect 180 concurrent videoconferencing participants, through Universal Port™ technology, with individually optimized continuous presence full frame rate high-definition videoconferencing. "With increased demand from our customers for high-quality videoconferencing, the carrier-grade Codian gateway from TANDBERG ensures we can consistently offer the most scalable and reliable solution," said Christopher J. Bell, Vice President, Engineering, Providea Inc.
"The enhancements to the MSE 8000 Series also reinforce the strong integration of Codian products into the TANDBERG total solution portfolio," said Håkon Dahle, TANDBERG Chief Technologist. "The TANDBERG Codian product combination provides customers with a comprehensive solution for deploying videoconferencing as part of their unified communications strategy." TANDBERG is a leading global provider of telepresence, high-definition videoconferencing and mobile video products and services with dual headquarters in New York and Norway. TANDBERG designs, develops and markets systems and software for video, voice and data. The company provides sales, support and value-added services in more than 90 countries worldwide. TANDBERG is publicly traded on the Oslo Stock Exchange under the ticker TAA.OL. Please visit www.tandberg.com for more information. TANDBERG is a trademark or registered trademark in the U.S. and other countries. All other product and company names here in may be trademarks of their respective owners.